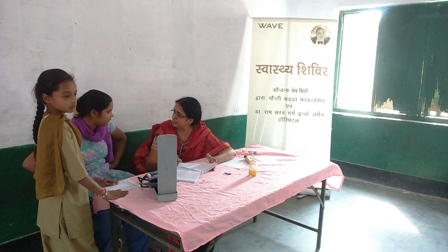 The Ponty Chadha Foundation in collaboration with Dr. Ram Saran Garg Indo German Hospital organized a health camp in Village Naiphal, Ghaziabad. The health camp was held between 10 AM to 1pm. The camp was organized at the village premises. The seating arrangement was made for around 30 to 40 patients who waited for their turn for the checkup. They were given a token number and then their names and age in the OPD card were registered. After this the patients went to the doctors for consultation subsequent to which they collected medicines from the medicine distribution counter. Many of the patients came in with skin ailments, complaints of joint pain and problems with hearing for which they were referred to the Indo German Hospital where they could undergo further checkup and discounts would be offered for their treatment. A total of 162 community members from 700 families attended the camp.